Cathedral – This sunroom offers the drama of a vaulted ceiling, making it ideally suited as a family “great room” for your home. Available configurations include Low Cathedral, which is designed for single-story homes; Factory Cathedral, which is designed for two-story homes; and Custom Cathedral, cathedral-style sunrooms that are custom sized to fit unique home heights and dimensions. 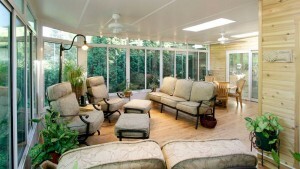 Studio – TEMO’s Studio sunroom features a gentle roof pitch that makes it a natural fit for just about all home styles. It is the most versatile of all of TEMO sunrooms. California – The California sunroom from TEMO has a visually dramatic split-level design that allows for additional natural light reception. A dual-level roof with additional glass lets natural light flood the sunroom during the day. All of the TEMO sunrooms that we offer are sturdily manufactured and perfect for creating a cozy, climate-controlled living environment that your family will be able to use year-round. If you love being outdoors but not having to contend with unexpected annoyances like rain, wind, and insects, then a sunroom is potentially a great option for you. For more information about TEMO sunrooms and the professional sunroom installation services that we offer in Des Moines, Iowa, please contact U.S. Patio Systems and Home Remodeling today.